The 10" Tubular Skylight is ideal for bathrooms, hallways, laundry rooms, closets, and other smaller areas. Coverage area is up to about 150 sq. ft.
Tubular skylights are energy efficient high performance lighting systems that are cylindrical in shape and are designed to light up rooms with natural sunlight. A small clear dome on the roof allows sunlight to enter into a highly reflective "light pipe" that extends from the roof level to the ceiling level. The light pipe is coated with silver, in a mirror quality finish, that allows the full spectrum of sunlight to be channeled and dispersed evenly into a room through a diffuser located in the ceiling. Tubular skylights are designed not to compromise roof integrity. They are designed to minimize the size of roof penetrations and totally eliminate the chance of leaks with their weather-tight installation. Why tubular instead of traditional skylights? Tubular skylights emit more light per given area, because of the high reflectivity of the mirror-like light pipe. Tubular skylights are far more energy efficient. The cylindrical design minimizes the area for direct light to enter and heat up the area and the thin light pipe radiates any collected heat into the attic area. Since the light pipe acts as a sealed shaft, very little heat escapes up the light pipe, whereas a tremendous amount of heat rises up the large shaft of traditional skylights. What this means is that there is no heat loss or gain in your room because of our tubular skylight. Tubular skylights scatter 100% of the natural light spectrum through the use of a diffuser, thereby eliminating the spot light effect common with the traditional system. 99% of harmful UV rays are absorbed by the tubular skylights special dome, light pipe and diffuser material, thereby eliminating the bleaching effect of UV rays on rugs and furniture. Tubular skylights are far more economical. A tubular skylight can be installed in less that two hours - a fraction of the time it takes to install a traditional skylight. No painting, no frame work and no drywall required for installation of a tubular skylight. Our flashing is constructed of heavy gauge aluminum with no seams, and its round shape minimizes damage to roof shingles during installation and enables it to withstand the stresses of expansion and contraction due to the temperature variations. The flashing is extremely important, as it is responsible for keeping your roof from leaking. It is exposed to the harsh effects of the environment on a daily basis. Our competitors use cheaper grade galvanized materials or plastic with tack welded or rolled seams. Our unique forward sloping flashing design eliminates the use of light robbing elbows that the competition uses in almost all applications. Our pitched flashing is designed to accommodate installations to standard ceilings from a pitched roof. Our flat flashing is designed to accommodate pitched roof to cathedral ceiling or installation on a flat roof. The dome allows for the sunlight to enter into the light pipe and it too is subject to the extremes of the environment. Our dome is constructed of hi-impact UV stabilized acrylic that is twice as thick as our competitors. Unlike most of the competition our low profile appearance allows the skylight to blend into the surrounding roof structure. Most importantly, our dome is rolled into a stress absorbing seamless aluminum collar, which evenly exerts the pressure caused by expansion and contraction due to temperature effects over the dome. All our competitors attach their dome directly to the flashing which stresses the dome at the contact points. The dissimilar materials of the dome and collar react to temperature effects differently, causing stress cracks to develop in the domes of our competitors. Manufactured by the leading firm in the industry, our light pipe is one of the best performing in the industry. Most of the competition uses cheaper grade, thinner gauge or less reflective light pipe. Our light pipe is assembled at installation, with three securing methods, ensuring a tight, dust free seal. We include four feet of light pipe in each kit, for a usable pipe run of 40". Additional lengths of pipe can be purchased and added to your shipment if required. The trim ring and diffuser assembly is the only piece in the entire kit that the homeowner sees on a daily basis, and it's the only item that the homeowner will ever touch. Our trim ring is constructed of seamless aluminum and is powder coated white in color. All of our competition offer plastic trim rings, and many have unsightly plastic tabs that hold the ring in place. Our diffuser snaps neatly into place for ease of cleaning, yet it provides a tight seal to ensure no heat loss up the light pipe. It's constructed of hi-impact acrylic, which makes it virtually unbreakable. Our standard diffuser is designed with a small arc that provides even light distribution without spotlight effects. Our competition offers primarily flat diffusers that are brittle and is not able to spread the light out as far. Alternative diffusers are available for you to customize your installation for the desired light distribution in the room. The prismatic diffuser's surface contains several small prisms to help spread natural light evenly throughout the room. Prismatic diffusers will put out the brightest, natural looking light. The white diffuser's surface is smooth and evenly spreads a softer tone of light. White diffusers put out less light than the prismatic diffusers and they look similar to a white florescent light. We offer several options to enhance our products. The Super Vent Fan available for the 10" kit provides a combination bathroom ventilation and lighting system, constructed of an all aluminum cowling that surrounds the trim ring of the skylight. The fan that exhausts the air is the quietest fan on the market and provides 125 cfm of air exchange, which is more than twice what typical bathroom vents provide. We offer an easy to install light kit that provides light through the tubular skylight during the evening hours. The Electric Dimmer Kit allows 90% reduction in the light brought into the room to allow use of the tubular skylight in a bedroom or family room with a media center where you might want to decrease the amount of light sometimes. They are available in all sizes and use a standard electric outlet in the attic space and a remote controller to operate and vary the light. We carry four different diameter skylights which put out an increasing amount of light the larger they are. Natural Light has 10", 13", 18", and 21" diameter units. Keep in mind - bigger is not always better! Remember, if you have any questions at all please don't hesitate to contact us and we will respond promptly. The 10-inch tube lights up a room of 150 sq. feet or less, putting out 330 watts of light. It is ideal for use in most bathrooms, hallways, walk-in closets, pantries, and laundry rooms. It is by far the most common size purchased and used by the homeowner. The 13-inch tubular skylight lights up an area between 150-250 sq. feet, for 500 watts of light. (It has the same size light pipe and performs the same as the "14 inch units our competitors advertise.) This size is most commonly used in kitchens, living rooms, family rooms, foyers, and garages. The 18-inch sky tube will light up an area of 300 - 500 sq. feet, putting 750 watts of light, and is best for rooms with vaulted ceilings, family rooms, living rooms, "great rooms", and garages. The 21-inch tube light, lighting up 500 - 700 sq. feet, is recommended for commercial flat roof applications only. Why choose Natural Light Energy System's skylights? Simply put, because Natural Light are the best tubular skylight you can buy! They have the best engineered tubular skylight on the market with the highest quality components. We have the #1 selling tubular skylight on the web. Why buy from The Skylight Guy? When you buy product from me, you not only are getting an excellent product, you get the customer service and knowledge of a professional that has personally installed thousands of units and is familiar with any question you may have in selecting or installing your tubular skylight. You get to buy at discounted dealer prices...you can't loose! I'll get your product shipped to you the same day you order. Please feel free to contact me with questions before you order, or if any questions arise as you install your new skylight! Because of the quality of the materials that go into their product, Natural Light Tubular Skylights will remain structurally sound in any environment for a lifetime. Their warranty reflects this quality by backing up their products with a 25 years warranty unmatched in the industry! Why Natural Light is "The Contractors Choice"? High quality materials throughout ensure no callbacks! Adapts to any type of roof system. Easy installation - very few steps to complete entire installation. Very attractive unit due to the ultra low profile. Seamless to ensure no leakage. 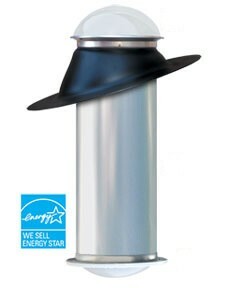 Exclusive dome stress ring isolates environmental stressing of the dome ensuring weather tight, long lasting fit.